Midland Publishing's Aerofax series keeps on going from strength to strength with good quality, well written and well produced titles. The edition covering the Saab JAS 39 Gripen is amongst their new titles and it certainly continues this trend. 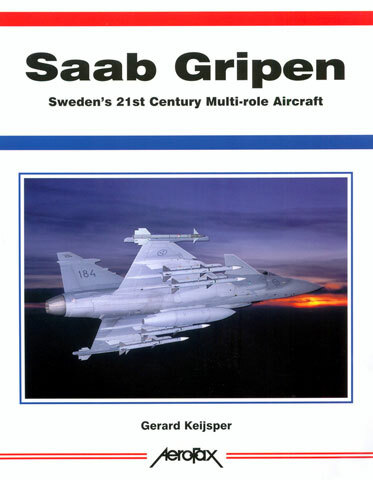 Consisting of 10 chapters, it covers the Gripen through its gestation, testing and development, and introduction into service. Other chapters include losses and the never ending quest for sales to other countries. The book contains 250 photographs and black and white line drawings. 247 of the photos are good quality colour shots. The photographic coverage includes shots of the cockpit as well as the armament and radar systems which will be a real boon to the modeller seeking information in detailing their kit. The book is soft back, 81/2" x 11" in size and contains176 pages printed on glossy paper between cardboard covers. This is a quality product that has something for both the aviation enthusiast as well as the modeller.